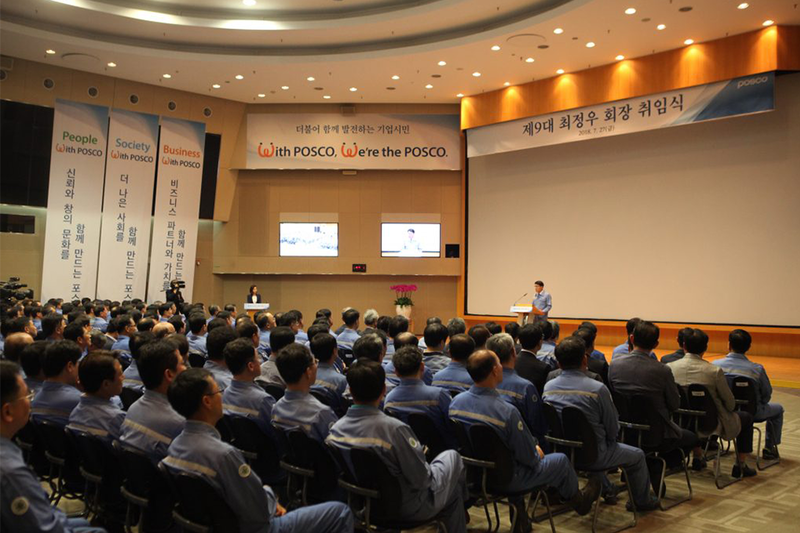 On the morning of July 27, POSCO held a shareholder meeting at the POSCO Center in Gangnam-gu, Seoul where the proposal to appoint Jeong-Woo Choi as the CEO and executive chief director was passed. POSCO held a board of directors meeting right after the shareholder meeting where he was formally appointed, thus concluding the appointment of the 9th CEO in POSCO. The new CEO then spoke at the inauguration ceremony at Pohang steel mill among 300 members in the audience including POSCO employees, labor-management councils, labor union representatives, executive council, chief community representatives, representatives of Pohang steel mill employees, representatives of suppliers, and suppliers’ council. The new CEO underscored the duty of ‘Corporate Citizens’ that fulfills social responsibilities, beyond the economic scope of generating profit. 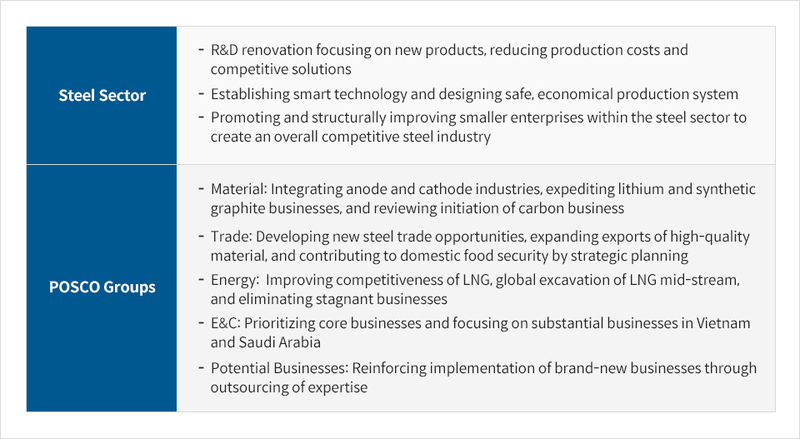 He continued that POSCO which had previously pressed on vigorously for the past half-century based on the belief of achieving excellence in steelmaking should now implement strategies to pursue harmony and coexistence with society, thus proposing ‘With POSCO’ as the new management mission. He suggested breaking new ground through Business With POSCO (pursuing mutually beneficial values with customers, suppliers, and business partners), Society With POSCO (creating a better society), and People with POSCO (creating new corporate culture through building trust and cultivating creativity). 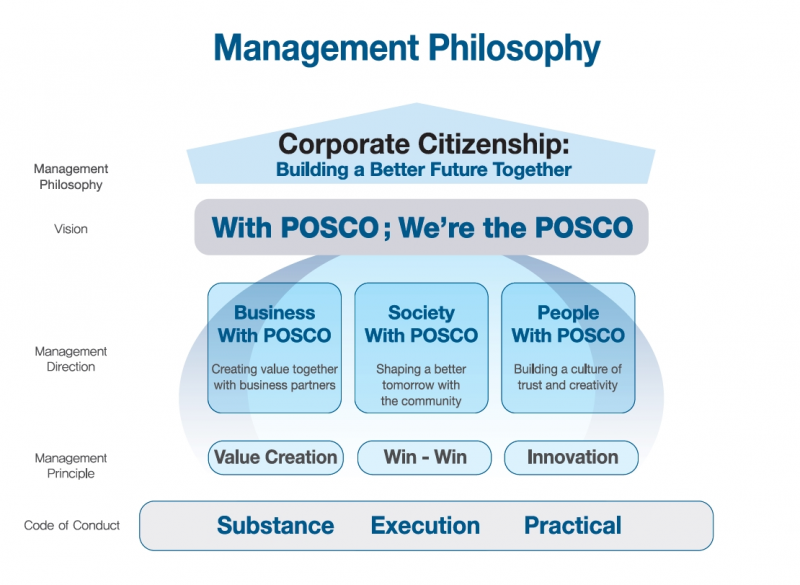 Choi additionally emphasized the significance of establishing a mature corporate culture as the new branding of POSCO, pursuing harmony as corporate citizens by suggesting detailed plans of action to implement these three major strategies— Seeking substance over formalities, execution over briefing, and profit over justification. After the inauguration ceremony, the new CEO was then transported to the site of Pohang 2nd blast furnace to encourage field staff. Then on Monday, he visited the Gwangyang steel mill again to greet workers and exchange words of encouragement. 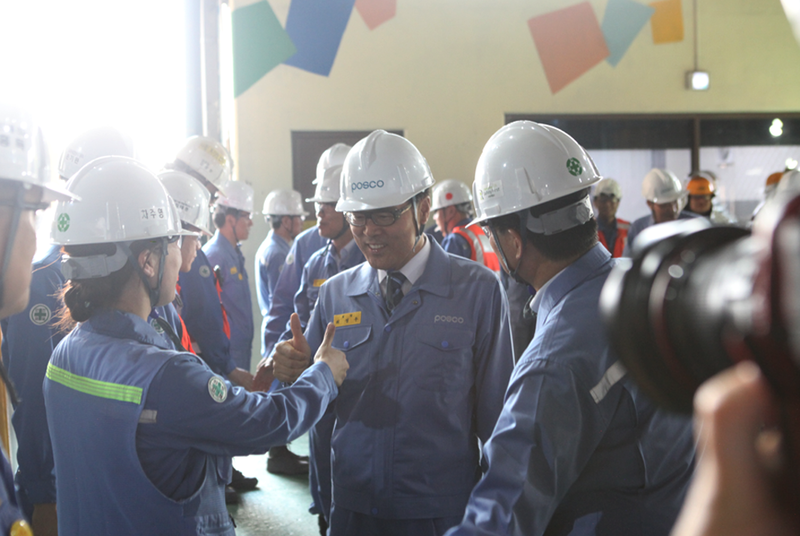 After the inauguration ceremony, the new CEO visits Pohang 2nd blast furnace to greet and encourage field staff. After entering POSCO in 1983, CEO Jeong-Woo Choi took charge of key positions such as accounting, cost management, audit analysis, auditing, and planning. His work experience spans decades which includes Chief Financial Officer in 2006, Managing Director of POSCO E&C in 2008, Precision Management Managing Director in 2010, its Executive Director in 2012, Vice President of Financial Planning and Management of Daewoo International in 2014, Vice President of Daewoo International in 2015, Vice-President CFO of POSCO in 2016, President CFO in 2017, and CEO of POSCO CHEMTECH in 2018.